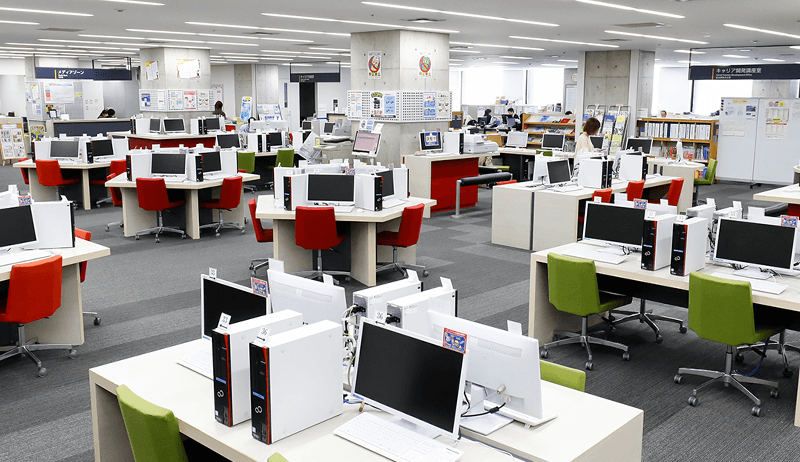 The Centers for Information Media Studies were created to maintain Aichi University’s information learning environment and to encourage computerization in the University’s various fields of education and research. By taking advantage of the Centers, University students gain information literacy, becoming familiar with technologies that they can use in their learning environment and gaining knowledge about information technologies that they will be able to put to immediate use in today’s information-driven society. Together, the three Centers—one at each campus—provide a total of approximately 1,150 computers for student use. All computers are connected to the University’s LAN as well as to the Internet. The Centers’ training labs and multimedia classrooms are used for a wide range of purposes, including classroom instruction such as information processing seminars; sending and receiving email; searching the Internet; writing reports and theses; holding courses conducted by the Centers on basic applications such as email, word processing, and spreadsheet software; and holding qualification examination preparation courses conducted by the Extension Center. Between them, the three Centers for Information Media Studies provide a total of approximately 1,150 computers. All are connected to the University’s LAN as well as to the Internet. Student advisors are available at the Centers to help students with computer and network problems, allowing even beginners to use computers with peace of mind. In addition to computers for email and Internet use, the Centers provide an extensive selection of audiovisual technologies including video, CD, LD, and DVD equipment. Students can use these media zones for relaxation as well as learning. All faculties conduct information processing courses where instructors teach everything from basic computer operation to advanced programming. Here students gain the skills they’ll need in today’s information-driven society. The Centers’ Multimedia classrooms are used for a wide range of purposes, including classroom instruction such as information processing seminars; sending and receiving email; searching the Internet; writing reports and theses; and holding qualification examination preparation courses. The Centers hold free-of-charge courses that teach students how to use key word processor, spreadsheet, and presentation applications, providing skills that will be useful not only as they make presentations and write reports during their academic careers but also when they find employment after graduating.